Allergies are hypersensitivity reactions of the body’s immune system to specific substances we come in contact with called “ allergens”. These allergens can be in the form of pollens, insect venom, drugs or foods that in most people result in little or no symptoms. The immune system thinks of these allergens as foreign substances that are attacking the body. The immune system goes to work producing antibodies to fight off these so-called foreign substances. Pollens from grasses, trees, weeds. Foods, most commonly dairy, seafood, eggs, nuts, meats. Fungi (molds) found in the soil, on foods, dark/moist parts of the home, carpets, air-conditioning ducts, etc. House Dust which contain mites (microscopic organisms). Animal Dander which is dried skin and mucous from house pets. Venom from insects such as bees, wasps and mosquitoes. What causes the allergic response? Allergic reactions involve a set of cells in the immune system known as “mast cells”. These cells help safeguard the body from attack from the outside world. “Mast cells” display a specific antibody known as Immunoglobilin Type E (IgE) on their surface. The “mast cells” store chemicals inside themselves known as granules. When the immune system encounters allergens (suspected foreign substances) a person is sensitive to it starts to manufacture the IgE antibody that will attach to the “mast cells”. It is when the buildup of these antibodies becomes so great it causes the mast cells to burst. This triggers the release of the granules stored inside the mast cells (degranulation) which spills into neighboring blood vessels and nerve cells. One of the chemicals that is released into the blood vessels is called “histamine”. It is the release and spread of the histamine throughout the body that causes the allergy symptoms. Allergy is a “threshold” disease. A person could be allergic to one or more allergens but the allergy symptoms do not appear until you reach a certain level of exposure. It is like having a half cup of water, that as new elements get added to it, the more full the cup gets. You may not exhibit allergy symptoms until you come in contact with that one last allergen that makes the cup overflow. At that point you have exceeded your “threshold”. This level is different for every person and is not measurable or able to be predetermined. The detective work begins to find which allergens are the culprits that caused the cup to overflow. Exposure to allergens we are allergic to has a cumulative effect. In other words, it may be exposure to that one last allergen that exceeded your threshold but it is the cumulative exposure to several allergens that could cause the allergy symptoms to appear. 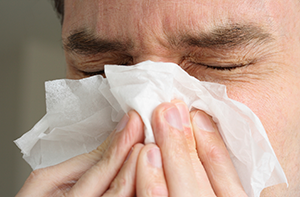 What do over-the-counter and prescription medications do for allergies? Since it is the histamines that circulate throughout the body that cause the allergy symptoms, the usual response is to take an “anti-histamine” product. These medications serve to mop up the circulating histamines (like a sponge) to help eliminate or provide temporary relief from allergy symptoms. These medications can not cure or prevent an allergy; merely mitigate the discomfort associated with allergy symptoms. This is an in vitro (outside the body) test using a small amount of patient serum tested in a laboratory. The method of testing utilized is known as ELISA (Enzyme Linked Immunosorbent Assay), but is often referred to as RAST, which was the acceptable method first developed in the 1970’s using radioactive isotopes to perform an in vitro allergy test. In the late 1990’s ELISA became the more accepted methodology using enzymes in the testing procedures rather than radioactive isotopes. What is this test looking for and how is it performed? This test is looking for the level of circulating IgE antibody to each of the environmental and food allergens included in the test panels. The level of IgE present indicates the degree of allergy to each specific allergen. A small amount of a patient’s blood serum is dropped onto a microtiter laboratory plate that has been coated with each of the allergens being tested for. Through a series of chemical washes, rinses and incubation periods, a chemical reaction takes place between the serum and the allergens on the plate. This reaction results in a color transformation. Using sophisticated laboratory instruments, this color reaction is measured and compared against individual positive and negative controls that are also run for each patient. The measurement of this reaction gives a numerical scoring indicating the level, if any, of allergy to each substance. What allergens can be tested for? Environmental allergens consisting of regional grasses, trees, weeds as well as fungi and epidermals. A total of 45 allergens are tested in this panel. Food allergens consisting of meats & poultry, seafood, dairy, vegetables, fruits, grains, spices, food additives, and other items. A total of 46 or 90 allergens are tested depending on the panel selected. Is there any preparation needed to take this test? There is no preparation necessary to take this test. The patient does not have to fast nor do they have to stop using any anti-histamines prior to taking it. This test is looking for circulating, allergen-specific, IgE antibodies which are not effected by whether the patient has fasted or is taking anti-histamines. What is the difference between the blood test and skin test performed by a physician? Test results based on observation and experience of physician shortly after administered for a limited number of substances tested. Will the test tell me if I am allergic to substances I have avoided for quite some time i.e. foods I have eliminated from my diet? No. The IgE antibody produced by the body has a certain half-life. If a long period of time has elapsed in that the body does not come in contact with a substance it has previously reacted to, it may eventually stop producing that antibody. Depending on the individual the life of those antibodies can be weeks or months before the IgE level has been depleted. A person should not eat foods they suspect or know they were previously allergic to prior to taking this test to find out if they are still allergic to that substance! This activity could be dangerous and/or cause discomfort if there is a true allergy response. The immune system has a permanent memory. It will always remember substances the body has been exposed to that it views as a “foreign substance”. Frequently if a person avoids a substance they are allergic to for quite some time and then is exposed to that substance once again(i.e. reintroducing foods into the diet), the allergy symptoms may reappear more severe than in previous episodes. How is this test administered? A small amount of blood (less than one test tube full) is drawn and spun down and separated into serum. It is the serum portion of the blood that contains the “mast cells” that have allergen specific IgE antibodies attached to them. The test tube of serum, along with an allergy test order form is sent to the allergy testing laboratory the same day it is drawn. The level of allergic reaction is expressed in numbers ranging from 0 to 5, with 0 being the least amount of antibody found and 5 being the highest. As a general rule, the higher the number, the higher the level of circulating antibody. What should I do if tested positive for allergies? You should always consult a physician when interpreting any medical test report. As a general rule, if you have an allergic response to a specific allergen, the best course of action is avoidance of that item. With airborne allergens this is very difficult to do and your physician should determine if you are a candidate for allergy shots (immunotherapy) and which foods should be avoided or eliminated from your diet. If a person has a true allergy it means there is a measurable amount of circulating, allergen-specific IgE antibody in the blood. Some people exhibit allergy-like symptoms yet there is no allergen specific antibody found in their blood. There are environmental and food substances that people have a sensitivity to but not an allergy although exhibiting similar symptoms. A major difference between an allergy and a sensitivity is that the latter may be more temporary and will dissipate sooner than upon eliminating the exposure to or consumption of the substance in question. This situation occurs frequently with cats where a person exhibits allergy symptoms if they come in contact with cats but there is no significant level of cat allergen IgE in their blood. Removing oneself from contact or the vicinity of the cat you should notice the allergy-like symptoms subsiding rather quickly. In a true allergy the symptoms would remain for quite some time if the immune system was triggered sufficiently to start producing IgE antibodies. Some people have a medical condition known as intolerance i.e. lactose intolerance and gluten intolerance. The symptoms associated with these conditions are similar to some allergy symptoms but a physician will have to perform specialized tests of the gastrointestinal system to diagnose these. Allergens: substances that trigger reactions such as dust mites, pollen, molds, pet dander, foods. Allergic rhinitis: an inflammation of the mucus membranes of the nose from an allergic response known as hay fever. Allergy skin test: the injection of a small quantity of an allergen into the skin; used to determine what allergens are triggering an allergic response. Anaphylaxis: a rare, life-threatening allergic reaction that affects several parts of the body at once; symptoms could include a dangerous drop in blood pressure, flushing, difficulty breathing, swelling of the throat, tongue and nose, and loss of consciousness. Antibody: a disease-fighting protein (also called immunoglobulin) made by the immune system to fight foreign substances in the body. When the body forms a type of antibody known as IgE (Immunoglobulin E) against certain substances you may develop an allergic response the next time you are exposed to that substance. Antihistamines: a group of medications that attempt to block the effects of histamine and reduce the allergy symptoms. Asthma: a condition in which the lungs overreact to stimuli such as allergens, exercise or cold air. Symptoms include coughing, wheezing, shortness of breath, chest tightness and overproduction of mucus. Eczema (atopic dermatitis): an allergy symptom consisting of red, itchy, crusty, or scaly skin; usually on the elbows, knees and in skin folds. Epinephrine: a naturally occurring hormone, also called adrenaline, used to treat anaphylaxis. Histamines: a chemical released in the body fluids that triggers allergy symptoms. Hives: an allergic reaction of the skin consisting of itchy, raised white lumps surrounded by an area of red inflammation. Immunotherapy(allergy shots): treatment for people allergic to pollen, house dust mites, fungi; involves injections of gradually increasing doses of the very substances to which a person is allergic in order to reduce the immune system’s sensitivity to those allergens. Pollen count: an approximate measure of the concentration of all the pollen in the air in a certain area at a specific time. Pollen counts tend to be the highest early in the morning on warm, dry, breezy days and lowest during chilly, wet times. Allergen listing of all testing panels. Common questions and answers about allergies. List of allergens tested for by region. Ready to print front and back trifold to market allergy testing. Instructions on performing the blood draw and shipping samples for testing.